In prior years, we have had paddling groups which consisted of one guide and around 10 paddlers. This year we are going to let paddlers paddle in groups of at least three and have "Yellow Shirts" (Paddle Guides) stationed at spots where we believe paddlers may get into trouble. There will always be at least one "Yellow Shirt" at the front of all paddlers and NO ONE IS TO PASS THESE PADDLERS. Similarly, there will be at least one "Yellow Shirt" that will act as "Tail End Charlies" and NO ONE IS TO FALL BEHIND THESE PADDLERS. Each time you enter the water and get off the water at a designated break (morning tea, lunch, afternoon tea), you must get your boat number highlighted by the "Clip Board Marshall". It is critical we know where all paddlers are at all times. The "WomDomNom" is not a race, but designed to be a relaxing paddle. Safety is of paramount importance. 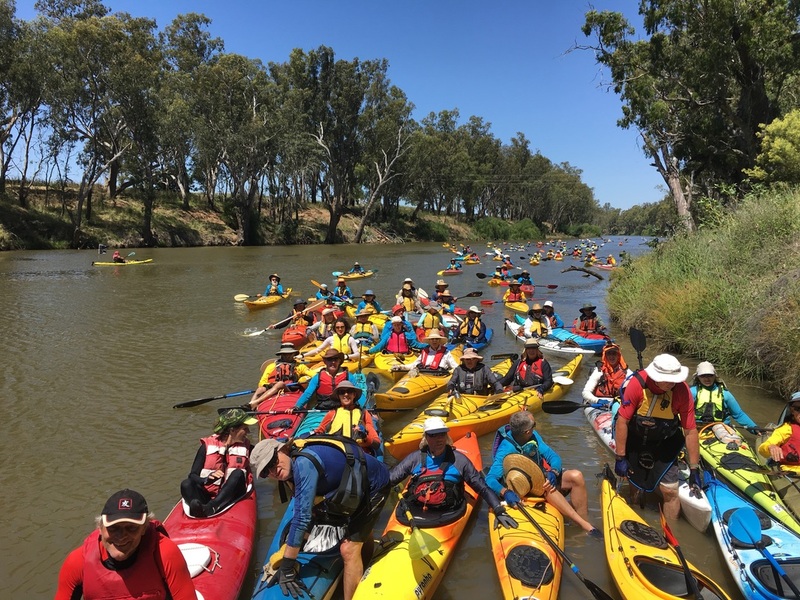 We will paddle 155km of the Macquarie River, and it changes constantly from long straight slow moving water, to fast flowing rapids to tight bends with potentially dangerous willow trees. We cannot stress enough how important it is to paddle in groups of at least three vessels. Would you like to be part of our crew? The roles are many and varied and you can commit for the whole paddle or just a few hours if that's all you can spare. Send us an email or contact us on facebook so that we can tell you what's involved. It is a requirement of this event that all participating paddlers and Support Crew have PaddleNSW Insurance. This is automatically included for PaddleNSW members, and can be arranged as Single Event insurance for non-members and crew. Current cost is $20 for paddlers, free for crew. The WomDomNom is not an event for first-time paddlers. It is a requirement that participants be able to maintain a speed of 6kmh and negotiate grade 1-2 rapids and this takes practice. Sydney : The River Canoe Club in Sydney is once again partnering with our club to help improve the safety and enjoyment of the WomDomNom and this includes boat hire, tuition and practice days. The Macquarie River Paddle Club owns 6 single kayaks that may be available for use by local paddlers if not already allocated.